Editor’s Note: This article orginally appeared on our MacUser.com blog. Apple has informed customers who ordered Mini DisplayPort to Dual-Link DVI adapters that shipping of the accessory has been delayed. The $99 adapter lets the Mini DisplayPort-equipped laptops introduced by Apple in October work with Dual-Link DVI displays. According to a customer notice forwarded to MacUser, Apple cites an “unexpected delay” and apologizes to customers for “any inconvenience” the delayed order causes. The notice also informs customers that the Mini DisplayPort to Dual-Link DVI adapter will ship on December 18, with delivery by December 23. 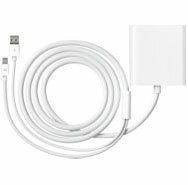 Likewise, the online Apple Store now lists a delivery time of four to five weeks for the Dual-Link adapter. The adapter lets users connect a 30-inch Apple Cinema Display HD to any MacBook, MacBook Pro, or MacBook Air with a Mini DisplayPort. Apple added the port—a smaller version of open industry standard DisplayPort—to its laptop line a month ago. The Mini DisplayPort is much smaller than the full DVI connector found on previous MacBook Pro models.